Inspired by mechanical ballet and automata, Orkestriska’s Box is a literal title for a piece that is centered around a human-scale music box containing the dancer Orkestriska (pronoucned Orca-stritz-kah). Moira Shearer as Olympia in The Archers’ 1951 operatic-film ‘The Tales of Hoffman’ is an express reference for the character of Orkestriska. 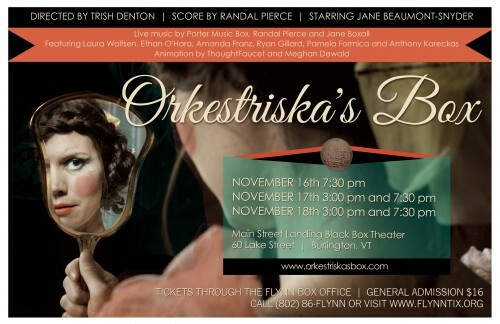 Conceived and directed by Trish Denton, this mixed media production is an ensemble piece set to a score by Burlington-based musician, Randal Pierce. The original compositions will be played live on a Porter Music Box, accompanied by Pierce on piano, Jane Boxall on bells and the operatic voice of lead performer, Jane Beaumont-Snyder. Classical dance, street theater, animation and silent acting portray the mythical life and dreams of the music box dancer: Orkestriska. Orkestriska prefers the repetition of her reflection of technical perfection to that of the world outside –the streets beyond her window. The street scenes are brought to life by an ensemble comprised of dancers, street performers and physical actors. In the abstractions of persistent, prodding dreams, Orkestriska struggles to realize what threatens her about her desire to live freely in the din and grit of the world outside her box. These bizarre manifestations are brought to light by stop-frame animation — the mystical creations of Meghan and Gahlord Dewald of Thoughtfaucet Studios. © 2019 In Tandem Arts. In Tandem Arts. All rights Reserved.